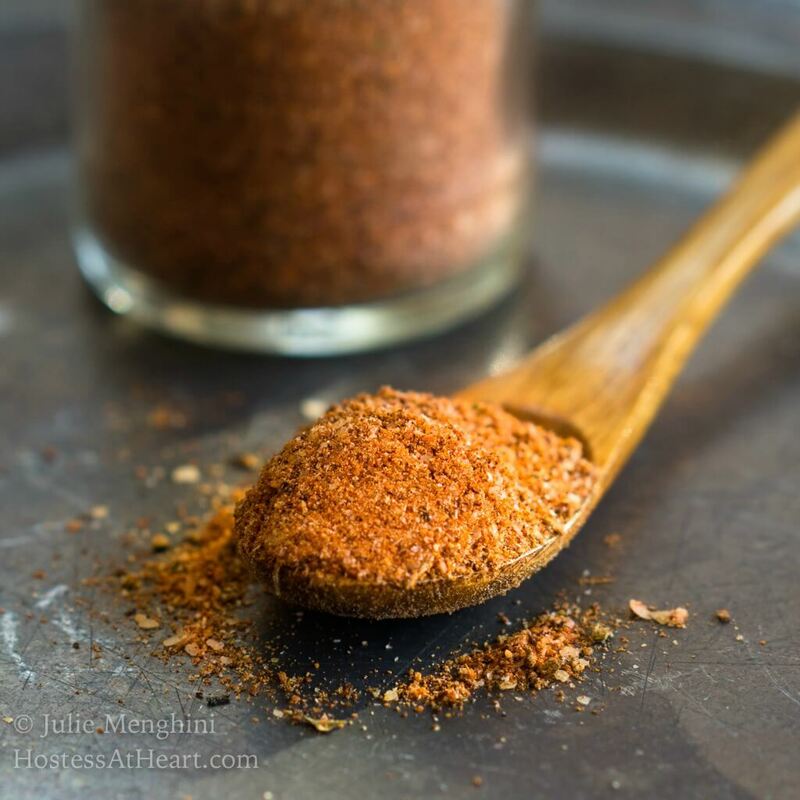 Julie’s Spice Rub recipe is the perfect balance of slightly sweet with a bit of heat. It has a deep flavor but not so overbearing that it takes over the taste of your food. John and I love to grill. We used to slather a lot of our grilled meat with sauces, but we’ve really taken a liking to dry-rubbed meats. If we want a sauce such as a barbecue, we will serve it as a condiment. It took a while to come up with the perfect spice rub for a long time, and I believe that we finally got the one that we really enjoy. This Spice Rub recipe is a keeper. We use this dry rub on any kind of meat, such as pork, chicken, and shrimp. It’s great sprinkled on sweet potatoes too! It’s slightly sweet and has a little heat too. The flavor is deep but not too strong that it takes over the flavor of what you are applying it too. I make up a large batch and just keep it in an empty spice jar. You’ll want a large batch too! 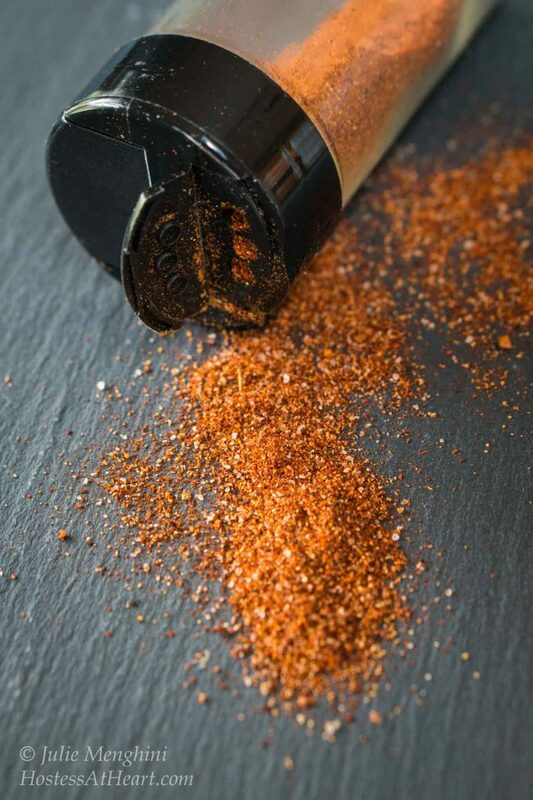 Julie's Spice Rub recipe is the perfect balance of slightly sweet with a bit of heat. It has a deep flavor but not so overbearing that it takes over the taste of your food. Store in an airtight container. Store in a cool dry place. When you have your own spice blends planning meals becomes so much easier. You can add a rub to any meat and it will act as a marinade adding flavor as it sits. Sprinkled on chicken breasts and it’s ready to grill. Say goodbye to boring! Do you make your own spice blends? What is your favorite way to use them? I love mixing my own spices and here are a few more that I keep in my spice cabinet 24/7! Hi Julie, I have a question. Do you think this would be good on salmon? Also, what is your favorite meat to put it on? I am planning on trying it this week. I love it on pork, beef or chicken, I’ve never put it on salmon. I’ve used it on wings, chops and ribs is amazing. It has that spice sweet thing going on, and if that appeals to you on salmon, I’d give it a try. Mix some up and taste it. I think that would help you decide? Let me know what you do. Thanks, Julie! I will let you know. I love spicy/sweet! Looking forward to trying it. Hi Julie, I just wanted to let you know I did try your rub recipe on salmon, and it was so good! I loved the combination of spicy and sweet. I am glad it makes a lot because I can’t wait to try it on other types of meat. Thanks so much for coming up with such a yummy combination of spices and sharing it with us! Thank you Shari! I really appreciate you stopping back and letting me know. John just went on a fishing trip and brought a bunch back and now I know it would be good on fish too. Hope you have a wonderful Mother’s Day! This sounds so good, Julie! I love all of the ingredients. I can’t wait to try it. Thanks for doing all the work for us figuring out the best combination and measurements! We love it on a lot of grilled meat Shari or even some veggies. I can’t wait until we can be outside and enjoy some great grilling. Thank you sweet girl! Hope you are enjoying your weekend and FF! 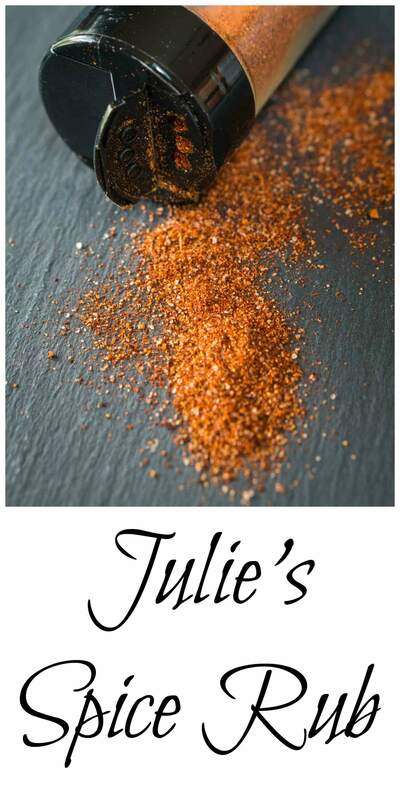 Perfect Julie, what a brilliant idea and just loving the name of your mix 🙂 I like the idea of brown sugar in it and with that heat and cumin, it can’t be beat! Roll on summer! Thank you Loretta! I agree 100%. Bring on summer!! Thank you Demeter! I hope you have a wonderful weekend! It sounds like a great spice mix – I’m always trying new ones and love discovering different combinations! Thank you Corina! The name of your blog says it all! Whenever my dad would go to US he would always pick up some Goode Company dry rub. It was my favourite thing on any sort of barbecued meat. This reminds me of it, with the sugar and spices. Sticky and glazed is one thing, but dry rub is another! It sounds so delicious Julie! Awe thank you so much. I love traveling and seeing experiences the different spice combinations. Slightly sweet with a bit of heat sounds great to me and I love your flavor combinations! Rubs are great because it’s a fantastic way to add tons of flavor quickly! Hope you have a great weekend! Thank you Kathleen! I hope you have a wonderful weekend too. 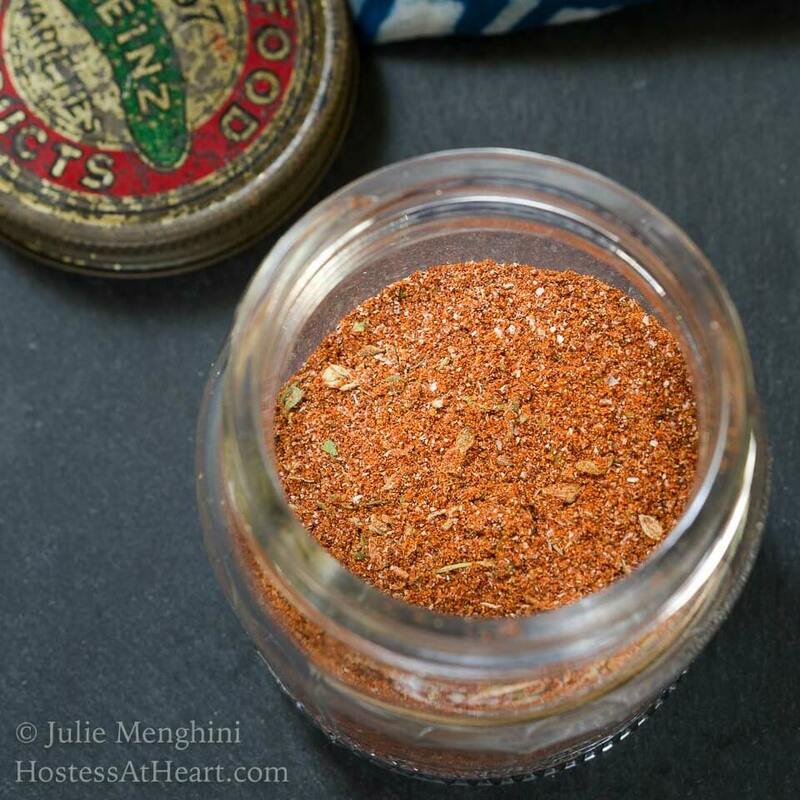 I love the slightly-sweet and spicy flavorings in this–sounds so good, Julie! Thank you Nancy! I just love what rubs do, especially on the grill. Have a wonderful weekend! Very similar to what we use. Love those rubs!! I bet your griller has some amazing mixes up his sleeve! I just love hanging out by the grill with an adult beverage. I’m waiting for some great weather. Enjoy your weekend! Thank you Ana! I’ve been using it for a couple of years and was worried that I’d loose it so thought it was time to get it on the blog. Thank you so much for your support! I’ve been looking for a good rub, this might also be good with my honey powder. A keeper, I’ve pinned it. Thank you. Honey powder? I’m going to have to check that out. Thank you Liz! Thank you Elaine! I hope you have a great weekend!